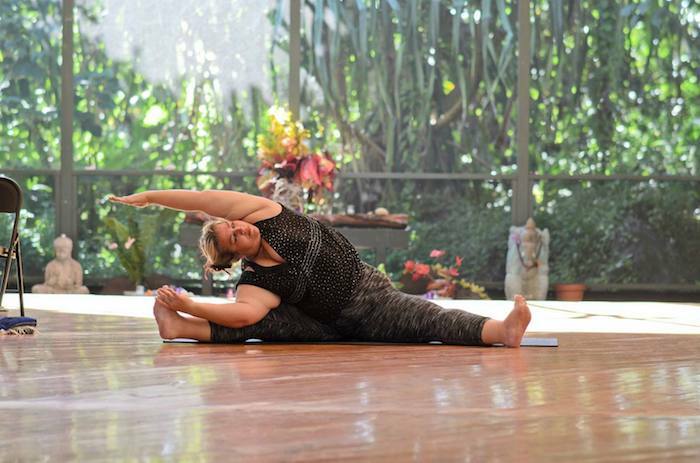 Kimberly offers two "Yoga is for Every Body" retreats in Hawai'i every year. Through yoga, nature, community and storytelling, Kimberly leads groups to their own skills of peace and cultural transformation. During this 5-day retreat, we'll explore the stories we carry and create in our bodies. We all carry the stories that were given to us, and we create more. Given that we can empower our own stories, it's odd how often we take on cultural definitions and identities. By focusing on pleasure, power and practice, we'll examine our stories and how they relate with others. Each day includes both active and restorative yoga practices, meditation, writing contemplations, storytelling games and activities (truly: fun, never intimidating). Whether you're a long-term practitioner or a beginner, this retreat will connect with your highest potential for alignment and restoration. Regardless of one's strength, abilities, size or body type, we all live with cultural messages about the body. Through level-specific instruction, you'll practice the benefits of yoga: strength, balance and flexibility - and learn how to take those concepts into a life full of self-love. In addition to our yoga sessions, we will also adventure to the most inspiring sites in the region. There will be plenty of time for relaxation or additional yoga classes. Yoga mats, props and blankets are all provided. Join the Facebook Group for photos, testimonials, and monthly writing prompts! I feel deeply moved and transformed. There are so many reasons why. Thank you Kimberly; your style is extraordinary to me. Rates and Booking: Early Bird Discounts are on for December - Register now! Choose from quadruple occupancy with private bath, triple occupancy with private bath, single occupancy with shared bath, double occupancy with private bath, and single occupancy with private bath (all rates include sales tax). A deposit of 50% tuition reserves your spot in the retreat. Full tuition for the June 2019 Retreat is due June 9, 2019. Full tuition for the December 2019 Retreat is due December 8, 2019. ​Please contact us for kama'aina rates. Don't need lodging? Contact us for commuter rates. ​Kimberly's Body Wise Professional Development Retreat takes place this June 10-15, right before the Yoga is for Every Body Retreat. If you book both retreats, you can take an additional $150 discount off the lowest price in your lodging category. Just pay the deposit for each retreat, and your final invoice will reflect the discount. Kimberly uses an Iyengar-style training and more than twenty years of experience with diverse yoga practices to challenge and welcome students of every ability and body type. She has taught yoga styles ranging from vinyasa, yin and restorative, to prop-assisted hatha yoga for people who don't feel comfortable in fitness settings due to size, health or anxiety. Her classes encourage personal sovereignty, inner voice and an entitlement to health and vibrancy at all sizes, ages and abilities.